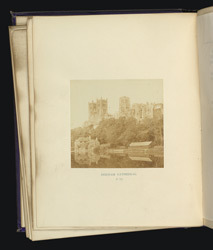 This view of Durham Cathedral illustrates verses from an 1866 edition of Sir Walter Scott’s long narrative poem, ‘Marmion’. They describe the wanderings of the body of the 7th-century saint, Cuthbert, Bishop of Lindisfarne, after it was taken from its resting place in Lindisfarne Priory by monks fleeing invading Danes in the late 9th century. The saint's body found its final resting place at Durham in a church on the site of the present magnificent Romanesque cathedral. Construction of the cathedral on a cliff above the River Wear began in 1093, and St Cuthbert’s shrine was transferred to it in 1104. Many miracles are attributed to the saint and Durham became an important site of pilgrimage. Sir Walter Scott (1771-1832) was the Scottish author of immensely popular historical novels and poems. Their epic combination of history, chivalry, and romance was especially beloved by readers of the Victorian era. ‘Marmion: A Tale of Flodden Field’, first published in 1808, tells the story of the noble but arrogant Lord Marmion, a fictional 16th-century English knight in the time of Henry VIII, and the fate of his two loves Clara de Clare and Constance Beverley. The story is intertwined with the antagonism between England and Scotland under the rule of James IV. When Henry VIII attempted to invade France, James declared war on England and led an invading army south. The poem takes its title and inspiration from the Battle of Flodden Field in Northumberland in 1513, at which James was defeated and killed with many of his Scottish nobles and thousands of his feudal army. This edition of the poem is illustrated with 15 photographs by the Glasgow-based photographer Thomas Annan of sites in Northumberland and Scotland which feature in the poem.